The Sandy Bottom District, also known as The Bottom, was developed as an African-American and Jewish business district in the latter part of the 19th century. Always a high-traffic area due to the location of the train depot on West Jackson Street, the development of industry in the vicinity only contributed to the quickened pace of “The Bottom.” By the late 1920s, the area was nearly completely developed with small restaurants, retail shops, groceries, and professional services. The presence of German-Jewish retail shop owners greatly increased after 1932, along with some Greek restaurant and retail store owners and African-American entrepreneurships. The creation of the Gateway district around U.S. 19 in the late 1960s brought a period of decline to both the Bottom and downtown in general, but by the late 1980s a slow-but-steady effort to re-invigorate and restore downtown began, with the re-development of “The Bottom” being a central effort of recent business interests. Request date/time availability and reservation information: Call (229) 227-4115. If date is available, the event will be noted as tentative on the online Amphitheater calendar until all paperwork is finalized. Meet with a representative from the City of Thomasville Marketing Department to walk through the Reservation Application process. Complete additional permit requests (obtained from the City of Thomasville Marketing Department). Other items that may be required include Outdoor Event Permit, Outdoor Event Permit Street Closure Requested (these permits include city service needs such as temporary power, barricades, trash receptables, etc. ), One-Day Alcohol Beverage Permit (note: Alcohol Beverage One-Day permits are granted for bona fide charitable & non-profit civic organiation consumption only. Proof of 501(c)3 is required. Upon submission of all completed applications and permit requests, materials will be reviewed by City of Thomasville Departments that are directly affected for approval or denial of Amphitheater use. Upon review of all affected Departments, applicant will receive notification of additional information needed or the approval/denial of Amphitheater use for the event. If event is approved, it will then be placed on the online Amphitheater calendar. Process payment of Amphitheater application fees. Programmable Hours: Mondays-Thursdays, Daylight-9 pm; Fridays-Saturdays, Daylight-11 pm. All events are to be completed no later than 9 pm Mondays through Thursdays and no later than 11 pm on Fridays and Saturdays. Lawn Seating Potential: Maximum occupancy 1,300 without added seating/dining provisions, Maximum occupancy 650 with added seating/dining provisions. These numbers are based upon industry square footage recommendation per person with, and without, added seating/dining provisions. Move-In/Out Time: Expected to be completed within the hours listed on application. Additional time must be approved by amphitheater manager and will be charged at the current rate. Private/Special Event Ticketed Area: Defined by the concrete pedestrian path that encircles the amphitheater. Access to the public restrooms may not be blocked at any time. 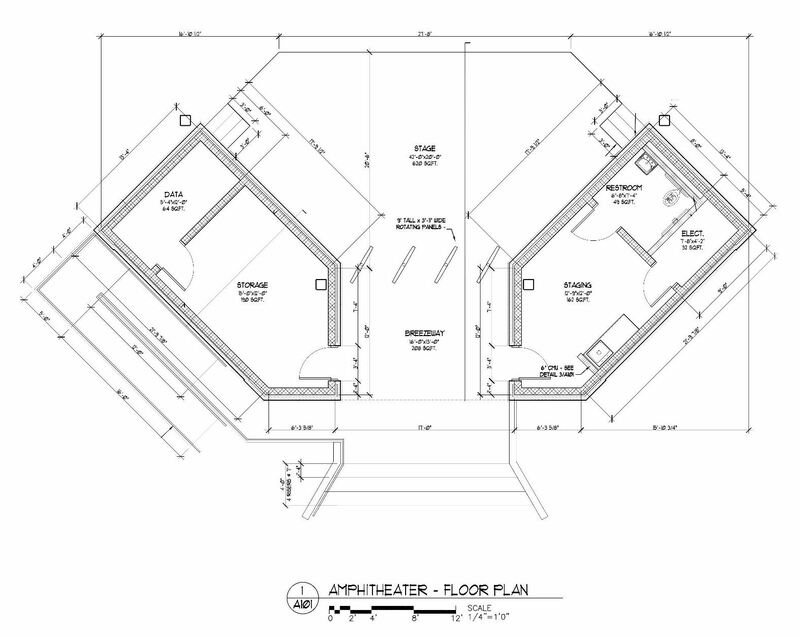 Sound/Lighting: Amphitheater is equipped with an in-house sound and light system. Details are listed on the Venue Sound/Lighting Spec Sheet. A meeting with the Amphitheater Manager to discuss event needs/requests is required. If your event will require more than a “basic wash” of sound or lighting equipment, it will be your responsibility to contract with a licensed sound/lighting company. All events are to comply with the City of Thomasville Noise Ordinance. A copy of the ordinance is listed on the Amphitheater reservation application. Tents/Canopies: Permitted only during event reservations. Tents over 10x10 must be approved prior to set-up. Additional requirements and inspections apply. It is the reservation holder’s responsibility to communicate all policies to the company providing tent services. Tents/canopies must be placed with weights, or other provisions, which do not require anything to be staked into the ground. Tent/canopy material must be flame retardant. Tents/canopies must be inspected by the Thomasville Fire Marshall following set up of tent and prior to event start. Inspections will be coordinated by Marketing during Reservation Application Process. Restrooms: A restroom facility is located on-site with separate men’s and ladies’ restrooms with regular and accessible units in each. Access to the public restrooms may not be blocked at any time. For an event where food and beverages will be served, it is recommended there should be 2 restrooms for every 100 people. If your event requires additional portable restrooms to be placed on-site, at least one (1) restroom per portable cluster must be accessible. If only one additional portable is provided, it must be accessible. Additional portable restrooms must be removed following the event. Parking Availability: Event visitors/volunteers/etc. are permitted to park in the Trinity Anglican Church parking lot (provided there is not an established church service/event taking place), area on-street parking and in the municipal parking lot adjacent to N. Stevens and W. Jackson Streets. Provisions are in place for food trucks to set up along the south sidewalk and along Stevens Street to the north and south of the amphitheater entrances. Food trucks may not block the Stevens Street pedestrian entrances and must leave pedestrian paths accessible. Food/Merchant/Caterer Vending Regulations: All food related waste must be disposed of properly. Grease, charcoal, grill drippings and oil MAY NOT be dumped in city garbage cans. All vendors are required to remove all large trash items from the premises. Vendors and caterers must make their own arrangements for disposing of such items. Please note insurance requirements required for all vendors. Insurance Requirements: General Liability Insurance is required from all organizations hosting events at the amphitheater. The insurance limits are $1,000,000 per occurrence and listing the City of Thomasville as additionally insured for the date(s) of the event. The certificate holder must be listed as City of Thomasville, 111 Victoria Place, Thomasville, GA 31792. Additional insurance is requested for any event involving the consumption of alcohol. All vendors/caterers are also required to provide a copy of their current General Liability Insurance Certificate naming the City of Thomasville as additional insured. Insurance must cover the event from set-up to tear down, if times are specified. Obtaining Outdoor Event Permit and, if applicable, One-Day Alcoholic Beverage Permit: In addition to standard Outdoor Event Permit forms and requirements, permits are required for events serving or selling alcoholic beverages. These permits must be obtained from the City of Thomasville City Clerk. Please contact the Thomasville City Clerk for these permits: (229) 227-7016. Note: Alcohol Beverage One-Day permits are granted for bona fide charitable & non-profit civic organization consumption only. Proof of 501(c)3 is required. Marketing: Use of the Amphitheater, or City of Thomasville, logos are subject to approval by the City of Thomasville Marketing Department. The amphitheater should appropriately be named Thomasville Amphitheater in all advertising. All permitted and approved events will be placed on an online calendar that will be visible at www.thomasvillega.com. Event Ticketing: All event ticketing (including promoting/printing/selling/etc.) is the responsibility of the reservation holder. A ticketing box office is not located at the amphitheater. Other Miscellaneous: Pony, or large animal, rides are not permitted in the amphitheater. Large animals include, but are not limited to horses, elephants, camels, etc. The amphitheater will not furnish tools and/or materials. No nails, tacks staples, brads, etc. may be driven into any portion of the amphitheater; and, no changes, repairs, painting, staining or alterations that will change the finish, appearance or contours of the buildings will be permitted without consent of management. Use of tape on equipment or building structure is prohibited unless prior authorization by management and only gaffer, spike or glow tape may be used. No exhibit may be displayed around the amphitheater or suspended from permanent fixtures or beams without the permission of the management. Equipment and/or furniture may not be moved by anyone except facility personnel and may not be used without the consent of management. Anyone found abusing, destroying or removing City property could be barred from the premises. Event is not approved until physical permits have been granted. Marketing/advertising may not take place until approval. Users of the Amphitheater are responsible for all repairs due to damages incurred as a result of event. Repairs will be coordinated through the Main Street office and completed as soon as possible following the incurred damage. Reservation Fees: A $500 damage deposit is required to secure requested date(s). Providing no damages to the Amphitheater are incurred during the reservation period, this damage deposit will be returned to the reservation holder following the reservation period. Civic/Non-Profit Rate: A rate applied to non-profit corporation (501 c3); charitable and civic organizations; arts groups; churches; schools; etc. $150 per hour (3 hour minimum), $750 full day. Proof of organization’s non-profit status is required. Commercial Rate: A rate applied to an entity whose primary objective is making of a profit. $300 per hour (3 hour minimum), $1,200 full day. Please note: If your event will require more than a “basic wash” of sound or lighting equipment it will be your responsibility to contract with a licensed sound/lighting company. Payment Terms: Accepted methods of payment are to be in U.S. Funds and by check or cash. 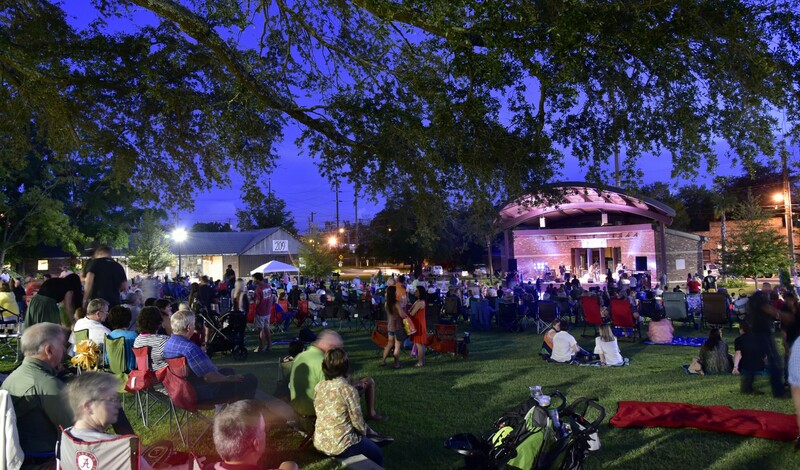 Please make checks payable to City of Thomasville – Amphitheater. Applications anticipating use of the amphitheater should be returned with the $500 Damage Deposit to reserve the date(s) requested. All pre-determined fees must be paid in full 30 days prior to event. Users of the Amphitheater are responsible for payment of all repairs due to damages incurred as a result of event. Repairs will be coordinated through the Marketing Office and completed as soon as possible following the incurred damage. Cancellation Policy: The City of Thomasville reserves the right to cancel an event due to special circumstances including, but not limited to: inclement or unsafe weather conditions, misuse or abuse of facilities, non-compliance with City of Thomasville event guidelines and non-permitted/prohibited events. In the event of an inclement or unsafe weather cancellation, the reservation holder has the option to reschedule the event reservation date/fees to a future date. The re-schedule date must take place within 3 months of the original date and is based upon Amphitheater availability. If a reschedule date is not agreed upon, fees will be refunded. In the event of a cancellation by the reservation holder that is not due to inclement or unsafe weather, as noted above, a reschedule date option is not available. Cancellation of an event by reservation holder more than 30 days before an event will result in loss of Security Deposit fee. Cancellation of an event by reservation holder less than 30 days before an event will result in loss of all fees, with the exception of inclement or unsafe weather as mentioned above. Stage Area: 620 square feet. It is approximately a 30’ wide by 20’ deep space; however, it is not a true rectangle. Stage Material: Concrete floors and brick walls. There will be a curtain track system installed along the back walls to allow for back drops to be provided and suspended around the rear perimeter of the stage. Load-In Area: Ramp from Stevens Street is located at rear of stage. For large acts bringing in additional rigging, and additional stage space, users can utilize pavers at front of stage. 9 ETC D40XT outdoor multi-color LED lights. Wall input at Front of House location to plug in non-city provided lighting console. Wall station on stage that provides 10 fixed static lighting presets. One 200amp Lighting disconnect for any additional lighting brought in by reservation holder. In-house sound system is minimum to provide basic audio for small events and rentals. The system consists of the following list. Note: Neither cables nor monitor speakers are provided and are reservation holder’s responsibility to provide. One 200amp, 3 phase disconnect for any additional sound brought in by reservation holder. Two 15" Weather Resistant Renkus Heinz TRX151/9 speakers. 1 sound system processor for speaker protection and fixed EQ of system for optimum performance. 2 channels of monitor amplifier is installed to power stage monitors. These are accessible in the stage floor pockets. They are speakon connections. 4 Seismic Audio 15” stage monitors. 4 25ft speaker cables with speakon connectors. 3 stage floor boxes for audio stage microphone inputs. 1 Shure ULX-D wireless handheld microphone. 1 Shure SM48S handheld wired microphone. 2 K&M mic stands with boom. 2 Whirlwind Imp passive direct boxes. 1 basic audio remote to turn system on and control of floor pocket jacks and basic monitor feed volume. 1 Midas M32R Rack mounted audio digital mixer in rolling case. The mixer can be rolled out at event space to front of house location and plug into cat6 cable to box. This cable will pass audio from the mixer to the provided stage snake head. This is a portable box that can be put out on stage for up to 32 audio inputs and 16 audio outputs. XLR “L/R Main” inputs to system processor for connecting third-party analog console on stage. CD/USB/Bluetooth player is provided to give access in the basic controller configuration for background music or basic events. Note: This CD player is located on the rear of the stage inside the rack. Thomasville Fire Marshall, or designee, is required to inspect the following prior to event start: Temporary Fencing, Tents/Canopies over 10x10 and all additional Fire Extinguishers. Fire Extinguishers: There are two (2) fire extinguishers permanently mounted at the venue site. They are located as follows: one (1) at rear of stage; one (1) at restroom facility. Both locations are noted on site map. Food Vendors and caterers are required to provide at least one operational fire extinguisher at their individual on-site booth/food truck location when they are cooking on-site. It is the event organizer’s responsibility to require this of on-site food vendors and caterers. Temporary Fencing: Private/Special Event Ticketed Area is defined by the concrete pedestrian path that encircles the amphitheater. Reservation holders utilizing any type of temporary fencing to maintain a designated perimeter area for an event must use freestanding, and weighted, temporary fencing structure. The temporary fencing must provide three (3) designated, and separate, entrance/exit points. Access to the public restrooms may not be blocked at any time. Two of the designated entrance/exit points must be located on separate sides of the perimeter of the Private/Special Event ticketed area fencing and are required to be at least 72” (six feet) in width and completely unobstructed by tables/chairs/etc. (gates not permitted). One of the designated entrance/exit points will be maintained at the rear of amphitheater lawn leading to the Public Restrooms. Accessibility and Event Site Plan: Please return the completed Accessibility Planner section (page 13) and include a detailed site plan with your application. These will be used in the event of such emergencies including, but not limited to: individual health emergencies, public safety, terroristic actions, evacuations, etc.). Detailed site plan to reflect all activities, equipment, restrooms, trash receptacles, street closures, staging, medical/first aid stations, etc. Security Requirements: Additional security is strongly recommended during show hours for events where near capacity crowds are expected, money is being collected, or alcohol beverages are served. Information regarding the hire of off duty officers is available from the Thomasville Police Department. Contact Mimi Parrish at (229) 227-7075 for scheduling information.